Lueder Construction recently completed the life safety, building security and HVAC upgrades At Peter Sarpy Elementary. Life safety and security considerations that were included in the project involved the installation of a fire sprinkler system throughout the building and inclusion of a new security entrance vestibule at the main building entrance. 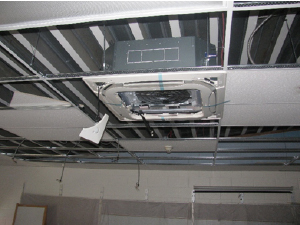 The HVAC renovations within the building involved the complete replacement of the existing HVAC system throughout the building. The previous building heating and cooling system consists of a steam boiler system and a central chiller unit. After a building analysis, the District decided to move forward to replace the existing HVAC system with a new VRF heating and cooling system. This is a highly energy efficient system that provides individual control in room areas. It is anticipated that the new heating and cooling system will save a considerable amount of utility and maintenance savings over the life of the system. 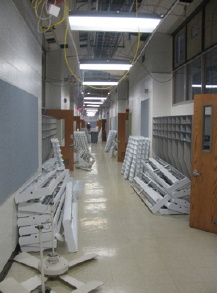 Also included in the building was the replacement of all of the existing lighting to new LED light fixtures. The new lighting will provide a significant cost savings to the District in the reduction of electrical costs. By going with the VRF systems and the LED lighting, the District also was awarded a significant rebate from OPPD for incorporating energy reduction methods in the building.